The Cenozoic Era is named from the Greek meaning ‘new life’, and is the time when modern life forms as we know them began to flourish — mammals, grass, the flowering plants and the insects that pollinate them. At the start of this era many Mesozoic forms became extinct, not only the dinosaurs but also ammonites, belemnites, many bivalves and chalk-forming nanoplankton. At the beginning of the Cenozoic the British Isles lay at a latitude of 43º to 47ºN, and since then has moved north to its present position (Figure P785800g). The climate has cooled progressively since the late Cretaceous, and may have been somewhat arid at times, but in the early part of the Palaeogene it was warm, supporting a lush vegetation. Early Palaeogene palaeogeographical sketch map. P785826. Most of the British Isles has been land throughout the Cenozoic. Volcanic and intrusive igneous rocks are an important feature of the geology of Northern Ireland and western Scotland where they are part of the North Atlantic igneous province. This major episode of igneous activity is represented only sparsely in England and Wales by the outer reaches of a dyke swarm that includes the Cleveland Dyke (intruding Jurassic strata in North Yorkshire), tholeiitic dolerite (intruding the Mercia Mudstone north of Shrewsbury), dykes on Anglesey and Lleyn and offshore (including the Fleetwood Dyke), and granite on Lundy Island in the Bristol Channel (Figure P785826). The Palaeogene suite of western Scotland and Northern Ireland is dated at 62 to 55Ma. Thus, it largely predates the Cenozoic sediments that are found in the south of England, but numerous ash beds recorded within the sediments show that volcanic activity continued in the North Atlantic province. The Cenozoic sediments are preserved in two major basins, the London and Hampshire basins. Other, smaller outcrops occur in Devon along the line of the Sticklepath–Lustleigh Fault at Bovey Tracey and Petrockstowe (G5) with smaller outcrops farther west in Cornwall (N1). At Mochras on the west coast of Wales, there is a thick succession concealed beneath younger glacial deposits. Elsewhere there are residual deposits of Cenozoic sediments, such as ‘clay-with-flints’, preserved in fissures and hollows in the underlying strata, and particularly in irregular karstic hollows developed on the top of the Chalk Group. Deposition of the Lambeth Group in the London Basin. P785828. The London and Hampshire basins are asymmetrical synclines, each with a gently dipping northern limb and steeply dipping southern limb. They are separated by the Pewsey and Weald anticlines. The sediments in these basins were formerly part of a large Cenozoic sedimentary basin covering southern England (Figure P785826), and during times of higher sea level there was intermittent connection with deeper grabens developing in the North Sea to the east and the Atlantic Ocean to the west. During intervals of low sea level, the basin was an area of swamp traversed by braided rivers, and thus the Palaeogene and Neogene strata of southern England record alternating transgressions and regressions (Figure P785828). The succession, from base to top, in the London Basin comprises the Thanet Sand Formation (G1), Lambeth Group (G2; Paleocene–Eocene), Harwich Formation (G3), Thames Group (G3) and the Bagshot Formation (G4). 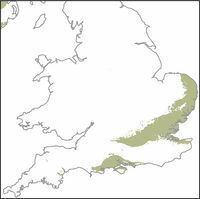 In the Hampshire Basin, the Thanet Sand Formation is absent and the succession consists of the Lambeth (Eocene), Thames, Bracklesham and Barton groups (G4; Eocene), and the Solent Group (G5; mainly Oligocene). The lithologies within the basins are generally similar but differ in detail; these are the sediments to delight children of all ages for there is mud, sand and pebbles in a range of vivid and unlikely colours, and fossils. Pebble beds interfingering with mustard-coloured sand in the Upnor Formation, Lambeth Group, Essex. P211781. Alum Bay, Isle of Wight. P649780. The Thanet Sand Formation (up to 30m thick) is a pale yellowish grey colour where it is weathered near the surface, and has been burrowed extensively by marine creatures so that few bedding structures remain. At the base is the Bullhead Bed, flint pebbles and cobbles in a matrix of clay with sand grains that are likely to have had their source in the Moine and Dalradian rocks of the Scottish Highlands. The Lambeth Group (G2) is up to 20m thick and has three formations. The Upnor Formation contains an abundance of well-rounded flint pebbles, shoreface deposits, and tidal sands (Plate P211781). Most of the mineral grains have a Scottish origin, but some indicate a different provenance, perhaps Armorica, Ardennes or the granites of south-west England. The Woolwich Formation, in the east, is a marine facies and shows a strong cyclicity in the pattern of sand, clay, pebble and shell beds. The shell beds have provided an abundance of fossils for the local museums over the years. The Reading Formation, in the west, was deposited on an alluvial plain where soil developed when conditions allowed. The sediments are particularly well exposed on the west coast of the Isle of Wight where they weather to a range of colours — yellow, brown, orange, red and purple — depending on the iron minerals that are present in the silty or sandy clay. The Harwich Formation (up to 10m thick; G3) is the oldest part of the Thames Group and consists of clay, cementstone and ash beds in the Harwich area with sand and pebbles in the London Basin. In places pebbles dominate and form stacked channel infills with large foresets and imbrication. Calcareous mollusc fossils and scattered sharks’ teeth are typical fossils. The London Clay Formation is present in both the London and Hampshire basins, and is up to 130m thick. It is a grey to blue-grey clay that weathers to a brown colour. The clay was deposited entirely in marine conditions during a number of transgressive-regressive episodes that can be correlated between the two basins. The Bagshot Formation (10 to 30m thick; G4) consists of sand of estuarine or shallow marine origin. In the Hampshire Basin, the formation is particularly well exposed at Alum Bay on the Isle of Wight (Plate P649780), where the multicoloured sands and clays, for which the bay is famous, range from beige to yellow to red. The excellent exposure here shows the succession from the top of the chalk through the Reading Formation, London Clay, Bagshot Formation and Bracklesham Group to the Barton Clay. The Bracklesham Group (up to 140m thick) consists mainly of glauconitic sandy clay with lots of shells and some plant remains; the plant debris and roots indicate coastal marsh interfingering with the marine sediments. The Barton Group is mainly clay in the lower part and sand in the upper part. Oligocene beds occur in Hampshire and on the Isle of Wight as part of the Solent Group (G5). The lowest part of the group, the Headon Hill Formation, is late Eocene in age. The overlying Bembridge Limestone and Bouldnor formations are together probably about 100m thick; the Bouldnor Formation consists mainly of clay but also contains limestone, ironstone and bituminous beds. Rich faunal remains include gastropods, fish, reptiles and various mammals. The beds were deposited in freshwater lakes, but there was also considerable brackish and marine influence. In west Wales, the Mochras borehole penetrated 524m of sand, silt, clay and lignite with conglomerates interbedded in the lower part. This thick sequence of river floodplain sediments is mainly Oligocene, and rests directly on the Lias Group of early Jurassic age. In Devon at Bovey Tracey (G5), a small but remarkably deep fault-controlled basin contains over 1000m of Oligocene lacustrine sediment that includes kaolinite-rich clay derived from the weathering of granite, and lignite (Bovey Formation). The clay is used for making ceramics and traditionally the lignite was used for firing the pots. Similar but thinner deposits occur at Petrockstowe. A hiatus in sedimentation during the Miocene probably indicates the period of maximum uplift associated with the Alpine Orogeny. Late Miocene sand (Lenham Formation) occurs in east Kent at about 190m OD, and is possibly of marine origin. 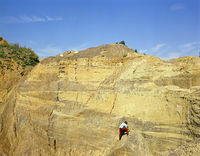 In East Anglia, Pliocene sediments are represented by the Coralline Crag Formation (N1), and consist mainly of sandy limestone, deposited under tidally influenced, shallow water conditions. It is the oldest formation of the Crag Group, which also includes the Red Crag, Norwich Crag and Wroxham Crag formations (N2) and spans the period from the Pliocene to the early Pleistocene. These formations are mainly shallow marine sand and gravel, but also include estuarine interbedded sand, silt and clay. The gravels in the Red Crag and Norwich Crag formations consist almost entirely of rounded flint pebbles. In the overlying Wroxham Crag Formation, pebbles of quartz and quartzite are common, having been transported into the North Sea basin by rivers flowing from the west. In Cornwall, well-stratified sands with clay and pebble beds are perched at elevations between 100 and 400m above sea level indicating substantial Neogene or post-Neogene uplift. These include the Crousa (N1) and Polcrebo (G5) gravels, and the StErth and StAgnes (N1) sands and gravels. Alpine folds in Jurassic and Lower Cretaceous strata, Lulworth Cove. P005798. The break up of the continent of Pangaea and the opening of the North Atlantic has dominated the tectonic history of the UK since Permian times. Extensional faults, many of which were reactivated older structures, controlled the development of the Mesozoic sedimentary basins of Cleveland, Cheshire, Worcester and Wessex. Sediments accumulated in these intracontinental sags during the Triassic and Jurassic, while considerably thicker sequences collected in the deeper offshore rifts of the North Sea and Irish Sea. In mid Jurassic times, thermal doming in the North Sea resulted in uplift and erosion over much of northern and eastern Britain, producing the Mid Cimmerian unconformity. As the thermal energy dissipated, subsidence and sedimentation continued into the late Jurassic and early Cretaceous when a further period of uplift and erosion occurred, marked by the Late Cimmerian unconformity. Regional subsidence during the Cretaceous resulted in gradual submergence of most of Britain. Compression and basin inversion at the end of the Cretaceous Period brought this episode of basin development to a close. The Alpine Orogeny has been attributed to collision of the European and African plates in Palaeogene to Neogene times. The most obvious result was the creation of the mountain chain that includes the Pyrenees and Alps, but distant waves of this event were felt in Britain where uplift and eastwards tilting triggered erosion that continues to the present day. The chief effect is seen in the younger strata of the south of England, where there was inversion of the Wessex–Channel Basin and uplift on three main structures: the Vale of Pewsey fault and anticline that passes eastwards into the Hog’s Back monocline, the Wardour–Portsdown fault and monocline, and the Purbeck–Wight structures (Figure P785829). 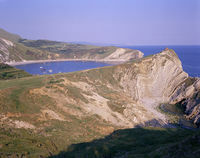 The Purbeck, Needles and Sandown monoclines, part of the Purbeck–Wight Disturbance, are well exposed on the Dorset coast and the Isle of Wight where the strata are vertical or overturned in places (Plate P005798), and displacement of the base of the Eocene strata is estimated at 1500m. Igneous rocks of north-west Britain are associated with contemporary rifting and the development of the North Atlantic. Only the outer reaches of the Palaeogene dyke swarm are found in England and Wales (Figure P785826), but altered volcanic ash within the sediments of the London and Hampshire basins also reflects distant volcanic activity. Wolf Rock intrusion south-west of Land’s End shows an earlier phase of igneous activity that is better developed offshore on the continental shelf. Schematic cross-section of the Wessex Basin. P785829. The major processes that have influenced the rock record in the past — continental rifting, thermal uplift and subsidence, compression, climate change, sea-level change and oceanic circulation—have all affected the Cenozoic rocks and serve to illustrate how narrow our picture of the earlier periods really is, and how difficult it is to separate the various effects of these processes.